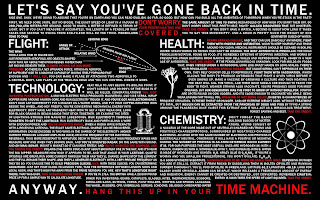 Let's say you've gone back in time. 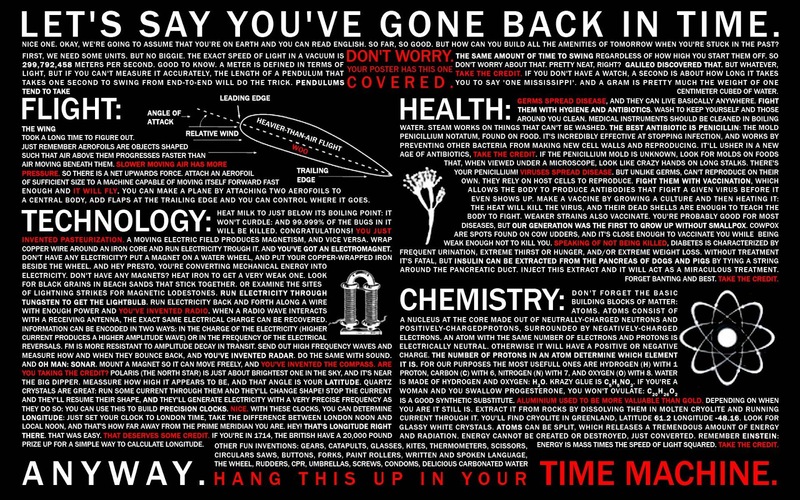 Let's say you've gone back in time. Nice one. Okay, we're going to assume that you're on earth and you can read English. So far, so good. But how can you build all the amenities of tomorrow when you're stuck in the past? First, we need some units. But no biggie. The exact speed of light in a vacuum is 299,792,458 meters per second. Good to know. A meter is defined in terms of light, but if you can't measure it accurately, the length of a pendulum that takes one second to swing from end-to-end will do the trick. Pendulums tend to take the same amount of time to swing regardless of how high you start them off. So don't worry about that. Pretty neat right? Galileo discovered that, but you learned it in high school. But whatever, TAKE THE CREDIT. If you don't have a watch, a second is about how long it takes you to say 'one Mississippi', or 'one one thousand'. And a gram is pretty much the weight of one centimeter of cubed water. The wing took a long time to figure out. Just remember those aerofoils are objects shaped such that air above them progresses faster than air moving beneath them. SLOWER MOVING AIR HAS MORE PRESSURE. So there is a net upwards force. Attach an aerofoil of sufficient size to a machine capable of moving itself forward fast enough and it WILL fly. You can make a plane by attaching two aerofoil to a central body, and flaps at the trailing edge and you can control where it goes. Heat milk to just below its boiling point: it won't curdle, and 99.999% of the bugs in it will be killed. Congratulations! You just invented pasteurization. A moving electric field produces magnetism, and vice versa. Wrap copper wire around an iron core and run electricity through it. And you've got an electromagnet. Don't have any electricity? Put a magnet on a water wheel, and put your copper-wrapped iron beside the wheel. And presto, you're converting mechanical energy into electricity. Don't have magnets? Heat iron to get a very weak one. Look for black grains in beach sands that stick together. Or examine the sites of lightning strikes for magnetic lodestones. Run electricity through tungsten to get the light bulb. Run electricity back and forth along a wire with enough power and you've invented the radio. When a radio wave interacts with a receiving antenna, the exact same electrical change can be recovered. Information can be encoded in two ways: in the charge of the electricity (higher current produces a higher amplitude wave) or in the frequency of the electrical reversals. FM is more resistant to amplitude decay in transit. Send out high frequency waves and measure how and when they bounce back and you've invented radar. Do the same with sound and you have sonar. Mount a magnet so it can move freely, and you've invented the compass. Take the credit. And while you're at it, make sure you name the magnetic poles backwards from what they are now,　because in your time, the North pole is magnetic south, and vise versa. So confusing. Polaris, or the North Star, is just about the brightest one in the sky, and it's near the big dipper. Measure how high it appears to be, and that angle is your latitude. If you can get your hands on Quartz crystals great, run some current through them and they'll change shape. Stop the current and they'll resume their shape, and they'll generate electricity with a very precise frequency as they do so. You can use this to build precision clocks. With these clocks, you can determine longitude, just set your clock to London time, take the difference between London noon and local noon, and that's how far away from the prime meridian you are. Take the credit for that too. If you're in 1714, the British have a 20,000 pound prize up for a simple way to calculate longitude. Other fun inventions: gears, catapults, glasses, kites, thermometers, scissors, circular saws, buttons, forks, paint rollers, the wheel, rudders, CPR, umbrellas, screws. Germs spread disease. Fight them with hygiene and antibiotics. Wash to keep yourself and those around you clean. Medical instruments should be cleaned in boiling water. Steam works on things that can't be washed. The best antibiotic is penicillin, the mold penicillium notatum, found on food. It's incredibly effective at stopping infection, and works by preventing other bacteria from making new cell walls and reproducing. It'll usher in a new age of antibiotics, so take the credit. If the penicillium mold in unknown, look for molds on foods that, when viewed under a microscope, look like crazy hands on long stalks. There's your Penecillium. Viruses spread disease. But unlike germs, can't reproduce on their own. They rely on host cells to reproduce. Fight them with vaccination, which allows the body to produce antibodies that fight a given virus before it even shows up. Make a vaccine by growing a culture and then heating it: the heat will kill the virus, and their dead shells are enough to teach the body to fight. Weaker strains also vaccinate. You're probably good for most diseases, but our generation was the first to grow up without smallpox. Cowpox are spots found on cow udders, and it's close enough to vaccinate you while being weak enough not to kill you. Speaking of not being killed, diabetes is characterized by frequent urination, extreme thirst or hunger, and/or extreme weight loss. Without treatment it's fatal, but insulin can be extracted from the pancreas of dogs and pigs by tying a string around the pancreatic duct. Inject this extract and it will act as a miraculous treatment. Forget Banting and Best. Take the credit. Don't forget the basic building blocks of matter: atoms. Atoms consist of a nucleus at the core made out of neutrally-charged neutrons and positively-charged protons, surrounded by negatively-charged electrons. An atom with the same number of electrons and protons is electrically neutral. Otherwise it will have a positive or negative charge. The number of protons in an atom determines which element it is. For our purposes the most useful ones are hydrogen (h) with 1 proton, carbon (c) with 6, nitrogen (n) with 7, and oxygen (0) with 8. Water is made of hydrogen and oxygen: H2O. Crazy glue is C5H5NO2. If you're a woman and you swallow progesterone, you won't ovulate: c20h2602 is a good synthetic substitute. Aluminum used to be more valuable than gold. Depending on when you are it still is. Extract it from rocks by dissolving them in molten cryolite and running current through it you'll find cryolite in Greenland, latitude 61.2 longitude -48.16. Look for glassy white crystals. Atoms can be split, which releases a tremendous amount of energy and radiation. Energy cannot be created or destroyed, just converted. Remember Einstein. Prize up for a simple way to calculate longitude. Anyway, hang this up in your Time Machine.